My Ten-Speed could beat up your Madone. Happy Bastille Day! 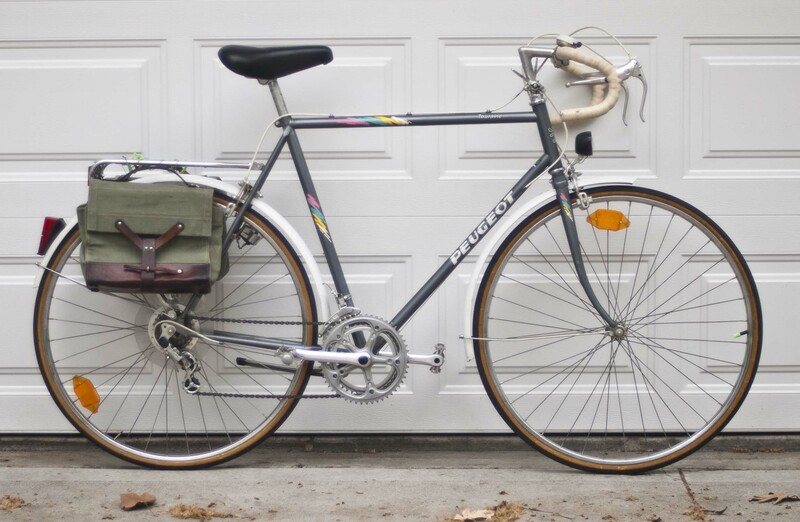 Here is a very cool, and apparently very rare, Peugeot Touraine sent in by Mark A. in KCMO. This is a very peculiar find in the Midwest – a French model that was never (apparently) imported into the the US, UK, Canada, or even other parts of Europe. Peugeot only lists it in the 1987 and 1989 French catalogs (maybe 1990 also, but I haven’t found a catalog to check yet) under the subtitle of “Demi-Course” in 1989 and “1/2 Course Randonnee” in 1987. It is clumped in with their Randonneur bicycles. My bike is completely original; however – as with all things Peugeot – the catalog specs often differ from the actual product distributed. The graphics seem to match the 1989 catalog. The bags are my addition: Swiss ammo bags. Other neat stuff: the racks, lighting, and fenders all seem to have been designed specifically for the Touraine, rather than “add ons.” The wiring for the lighting is internally routed through the tubes, like a French Constructeur rather than a stock “off the shelf” model bike. Good to know about the white saddle – something I happen to have on hand! Are you located stateside? I know there must be other Touraines over here, but I’ve only ever been made aware of one other, and example that was just sold on CL about a month or so ago in – I think – NH. Pretty cool, Mark. Looks like its in great condition, and probably would make a reliable commuter. It must have been a highly valued possession for its owner to bring it to the US.